We all love a good racing game, right? Whether you favour simulators like Project CARS 2; pure arcade silliness like OnRush; party delights like Mario Kart; or something like PGR that mixes styles; there is something for everyone. I personally love the simulators, but there is no denying that when the Forza Motorsport series pulled the handbrake and swerved off the circuits and onto the open roads, the then-new Forza Horizon really did break the mould. The series has grown in both quality and fanbase with each iteration, with the last game arguably being the best racer this generation has had to offer. Playground Games is back now, to see if it can go one better with its sequel. Having been to the US, mainland Europe, and Australia, the Forza Horizon festival has moved to the UK for its fourth outing – specifically Edinburgh and an idealised version of northern England, without the need for total authenticity. This means that the majority of the new map is set in rural locations, with narrow dirt tracks and tree-lined country roads; most of which can be torn up or blasted through, thanks to the number of destructible objects within the game world. I will never tire of being able to smash through the little stone walls that line a large percentage of the roads, it’s just so satisfying. Before you set out on your driving adventures, though, you will create your own driver. This is a simple character select rather than a Skyrim-like creation tool, but you will customise your avatar through their clothing and accessories. The more you play, the more chances you will have to increase your collection. It may simply be an evolution of what Forza Horizon 3 and Motorsport series did before, but it’s appreciated nonetheless. Customisation is a huge part of the game as usual, from your outfits to the cars and even buying new homes now. If you’ve played a Forza Horizon game before, you will know exactly what to expect here. There are races and various race-like events scattered all across the map, as well as speed traps and drift zones. On top of that, there are showcase events that offer big, daft set-pieces such as racing a hovercraft or a jet fighter, which have always been one of the best parts of the experience. Unfortunately, it looks like Playground Games has struggled to find fresh new ideas for this game, with only a couple of the showcase events actually feeling anywhere near the quality of those in previous games. I must admit though, that the Halo-themed showcase had me smiling from ear-to-ear the whole way through. 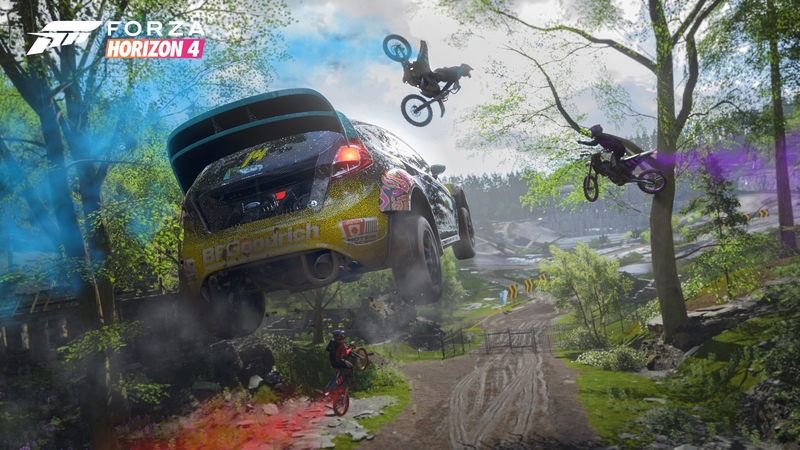 In addition to the returning events, Forza Horizon 4 has a number of story sequences for you to play through. Each story has ten chapters, offering different takes on a central theme. The first revolves around you being a stunt driver, and some of these feel like scaled down showcase events, focusing more on the car than the spectacle – but again, they’re a mixed bag. The third story is where I found the most fun, so it’s worth persevering through the repetitive second story. The map is soon littered with events from each discipline, adding new events every time you level up in the corresponding field. By the time you hit level 20 and the new seasonal events open up, you will probably notice that the map is much smaller than you might have realised. It isn’t tiny by any means, but it is noticeably small. Thankfully, the seasons can change the map and alter the way you play. 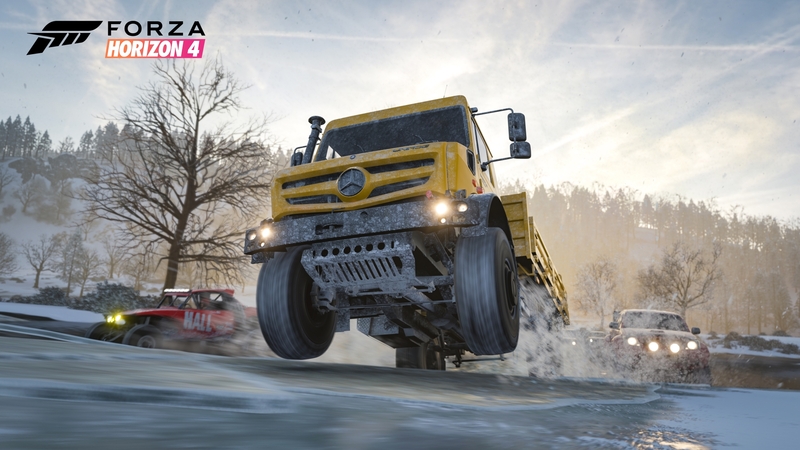 Obviously Winter is the biggest game changer, with lakes freezing over and offering new areas to explore, as well as requiring more focused driving due to the treacherous conditions, very much like Blizzard Mountain did in the previous game’s DLC. It’s a good job that the handling is better than ever before, then. Playground Games has always done a good job of taking Forza Motorsport’s realism and incorporating it into an open world game, tightening up how the cars and physics behave in order to keep things lighter and more fun. Nobody wants a clinical simulation in a game where you can race against a jet plane. Every car looks and feels the part. If you’re driving a Ferrari at high speed, it will give you a fight but you’ll always feel cool doing so. Similarly, driving a rally car or tuned-up 4×4 through the forests or bouncing over the hills is great fun. So what if you mess it up and hit a tree? That is precisely why the rewind feature is there. Simply go back to a point where you were in control, then resume the action from there. Just avoid the tree, this time. Between events, you can drive around without restriction. You can hunt down the Fast Travel and Influence boards that are hidden all over the map, or you can just stick on your favourite radio station and go for a relaxing drive down the coast. This freedom is part and parcel of the series and it’s just as good here as it has ever been. You’re not alone in Forza Horizon 4 though, as its shared world means that the AI Drivatars that would normally patrol the map, are replaced by real players, just like The Crew. You can choose to play alone if you like, but other players may be able to guide you to the hidden barn finds, or they can be invited to take part in co-op events to help earn you some extra Influence so you can progress faster and unlock new content. Remember how I mentioned the seasonal events that are unlocked at level 20? Well, alongside those (plus timed, seasonal barn finds) you will also unlock Forzathon Live events, which offers some of the most ridiculous, chaotic and fun moments you’ll find as you drive freely around the UK. Every hour, on the hour, you will be given the chance to get to a certain point on the map and participate in a live event with any other players that show up. You will all work together to progress through three challenges, such as driving through a speed trap as many times as you can, with everybody’s speeds adding up as you attempt to reach a set target. Don’t worry, you can’t collide with other players, so you’re free to drive through each other without penalty. The whole thing is reminiscent of Destiny’s public events, and it’s great fun. You can’t talk about a Forza game, in either series, without talking about the incredible detail put into its visuals. Each car is rendered down to the most minute detail, even down to your custom character in the driving seat. Droplets of water will wash over the bodywork and windscreen, splashing through deep water will wash away some of the dirt that has clung to the wheel arches – and the reflections are astounding. The environment itself is equally gorgeous, especially as each season brings with it its own unique look; and I have yet to see a single drop in the framerate. I have played it in full 4K in high quality mode on Xbox One X and it stayed locked at 30fps at all times. Equally, played at 1080p in performance mode, not once did I notice a dip below the advertised 60fps. It’s quite the technical achievement. It doesn’t skimp in the sound department, either. Engine noises are superb, with every single vehicle sounding as it should, in every type of environment. The game even subtly lowers the music volume when you drive through tunnels, emphasising the raw engine noise as you power along at speeds of over 150mph, and sometimes well over that. The soundtrack once again offers a large number of radio stations, with a little something for everyone: rock, classical, a bit of pop or indie; it’s all there. Horizon Pulse is still my station of choice, and once again it doesn’t disappoint. Following Forza Horizon 3 was always going to be a big ask, and although the map is smaller and the showcases are running out of steam, Forza Horizon 4 is still an absolutely stunning game to play. The new shared online experience adds an extra layer to this sequel, and the Forzathon Live and timed seasonal events will ensure that the game won’t run out of content any time soon. 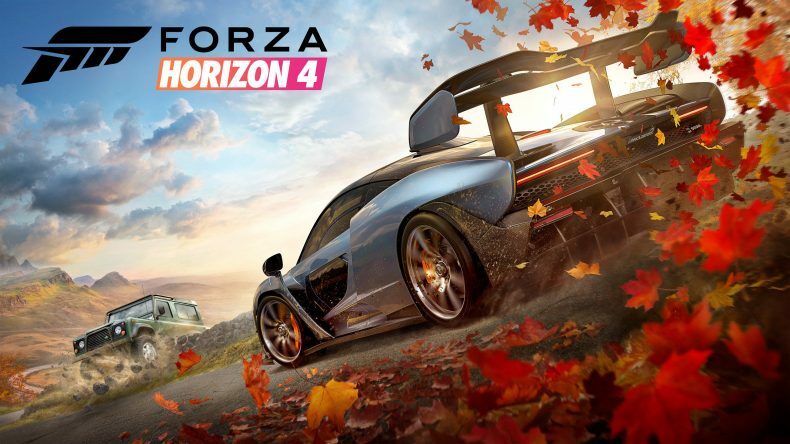 There is something truly special about Forza Horizon 4 and it is definitely a worthy addition to the series, sitting alongside its predecessor as the pinnacle of racing games. Forza Horizon 4’s handling is the best the series has ever seen, and its shared world gameplay offers an incredible amount of fun. It could well be the best racer out there.